There is more to walking than walking. Photos by Jan Gehl. Editor’s note: Streetsblog San Francisco is thrilled to present a three-part series this week by renowned Danish architect and livable streets luminary Jan Gehl. The pieces are excerpts from his book, “Cities for People” published by Island Press. This is part two. Donate to Streetsblog SF and you’ll qualify to win a copy of the book, courtesy of Island Press. It is a big day when at about one year of age a child takes that first step. The child’s eye level moves from the vantage point of the crawler (about 1 foot) above the floor to about 2.6 feet. The little walker can see much more and move faster. From now on everything in the child’s world — field of vision, perspective, overview, pace, flexibility and opportunities — will move on a higher, faster plane. All of life’s important moments will hereafter be experienced on foot at standing and walking pace. While walking is basically a linear movement that brings the walker from place to place, it is also much more. Walkers can effortlessly stop underway to change direction, maneuver, speed up or slow down or switch to a different type of activity such as standing, sitting, running, dancing, climbing or lying down. A city walk illustrates its many variations: the quick goal-oriented walk from A to B, the slow stroll to enjoy city life or a sunset, children’s zig-zagging, and senior citizens’ determined walk to get fresh air and exercise or do an errand. Regardless of the purpose, a walk in city space is a “forum” for the social activities that take place along the way as an integral part of pedestrian activities. Heads move from side to side, walkers turn or stop to see everything, or to greet or talk with others. Walking is a form of transport, but it is also a potential beginning or an occasion for many other activities. Many factors impact on walking speed: the quality of the route, the surface, the strength of the crowd, and the age and mobility of the walker. The design of the space also plays a role. Pedestrians usually walk faster on streets that invite linear movement, while their pace falls while traversing squares. It is almost like water, which flows rapidly along riverbeds but moves more slowly in lakes. Weather is another factor. People move more quickly when it is raining, windy or cold. 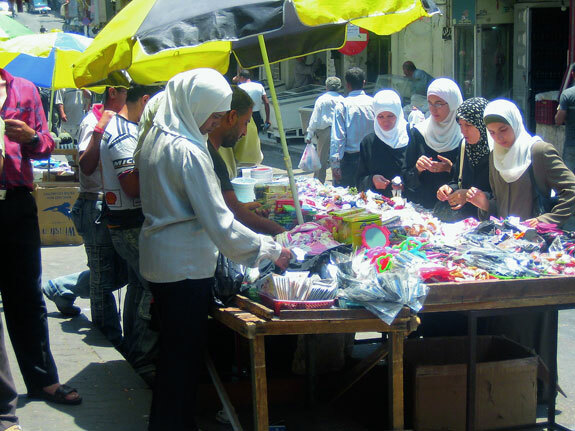 Life takes place on foot in Amman, Jordan. On Copenhagen’s main walking street, Strøget, pedestrian traffic on cold winter days is 35 percent faster than on good summer days. In summer there are many pedestrians in the city promenading and enjoying the process, while pedestrian traffic in winter is considerably more targeted. When it’s cold, people walk for warmth. On average the walking speed in summer is 14.2 min per km/23 min per mile, corresponding to 4.2 km per hour/2.6 mph. Corresponding winter walking speeds are 10.3 min per km/16.6 min per mile corresponding to 5.8 km per hour/3.6 mph. A walk of 450 m/0.3 mile takes about five minutes, while a walk of 900 m/0.6 mile will take about 10 minutes at 5.4 km per hour/3.4 mph. Naturally, these time estimates are only valid if the area is uncrowded and people can walk without obstacles or breaks. An acceptable walking distance is a relatively fluid concept. Some people happily walk many kilometers/miles, while even short walks are difficult for old people, the disabled and children. Walks of 500 m/0.3 miles are mentioned frequently as a distance most people are willing to walk. However, an acceptable distance also depends on the quality of the route. If the pavement is good quality and the route interesting, a considerably longer walk is often acceptable. Conversely, the desire to walk drops drastically if the route is uninteresting and thus feels tiring. In that case a walk of only 200 or 300 m/0.12 to 0.18 mile will seem like a long way, even if it only takes less than five minutes on foot. A distance of 500 m/0.3 mile as an approximate goal for acceptable walks is supported by the size of city centers. By far the majority of city centers are about one km2/0.39 sq mile, corresponding to an area of 1×1 km/0.6 x 0.6 mile. This means that a walk of a kilometer or less will bring the pedestrians around to most of the functions in the city. Huge cities like London and New York have corresponding patterns, as they are divided into numerous centers and districts. The magic one km2 center size can certainly be found in these cities. The acceptable walking distance does not change just because the city is larger. An important prerequisite for a comfortable and pleasurable walk is room to walk relatively freely and unhampered, without having to weave in and out and without being pushed and shoved by others. Children, older people and people with disabilities have special requirements for being able to walk unhindered. People pushing strollers, shopping carts and walkers also need plenty of room for walking. Groups of young people are typically the most tolerant about moving about in crowds. If we look at photographs from 100 years ago, pedestrians are often shown moving freely and unimpeded in every direction. Cities were still primarily the province of pedestrians, with horse-drawn carriages and trolleys and a few cars merely as visitors. In step with the car invasion, pedestrians were first pushed up along building façades and then increasingly squeezed together on shrinking sidewalks. 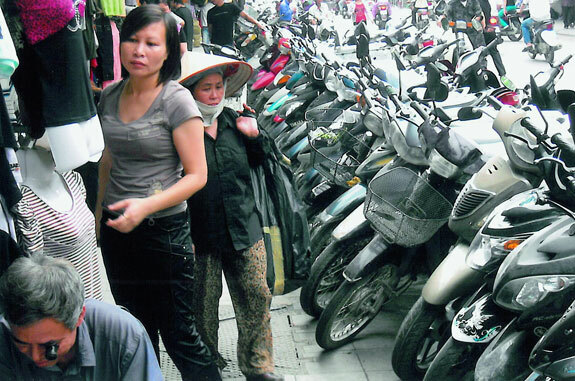 Crowded sidewalks are unacceptable and a problem worldwide. 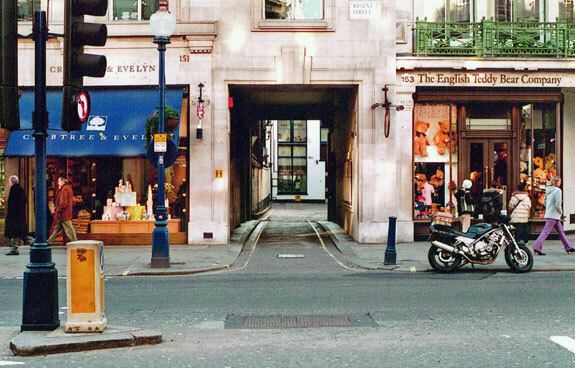 Studies of urban streets in London, New York and Sydney illustrate the problems of narrow sidewalks for large crowds of pedestrians on streets where most of the area is designed for car traffic, despite the fact that the number of drivers is far lower than the number of pedestrians crowded together on the sidewalk. The pedestrian traffic on sidewalks moves in columns that are pushed and shoved, and everyone must move at the speed dictated by the pedestrian stream. The elderly, the disabled and children cannot possibly keep up. 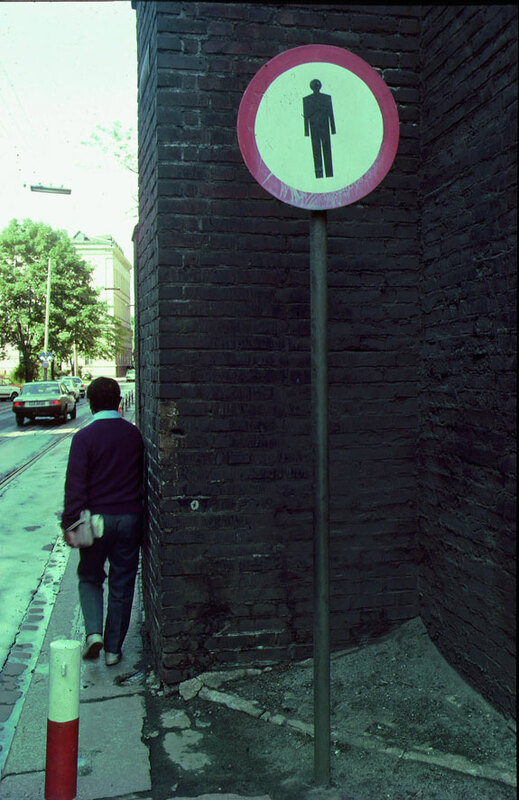 Various limits are suggested for what is considered an acceptable amount of space for pedestrian traffic, depending on context. Based on studies in New York, William H. Whyte proposes up to 23 pedestrians per minute per meter/three feet on the sidewalk. Studies in Copenhagen propose 13 pedestrians per minute per meter/three feet of sidewalk, if the limit for unacceptable crowding on sidewalks is to be avoided. If walking is to be comfortable, including acceptable distance and pace, there has to be room to walk without too many interruptions and obstacles. These qualities are often offered in dedicated pedestrian areas, but seldom on sidewalks on city streets. On the contrary, it is impressive to note how many obstacles and difficulties have been incorporated into pedestrian landscapes over the years. Traffic signs, lampposts, parking meters and all types of technical control units are systematically placed on sidewalks in order “not to be in the way.” Cars parked on or partially on sidewalks, thoughtlessly parked bicycles and undisciplined street displays complete the picture of a pedestrian landscape where pedestrians have to maneuver like skiers down a slalom course in order to move along sidewalks that are too narrow in the first place. The high priority given to car traffic and parking have created unreasonable conditions for pedestrians all over the world. Enough space for walking is impor- tant to all groups of pedestrians, but especially children, the elderly and the disabled. Interruptions in sidewalks to provide cars with uncomplicated access to garages, driveways, delivery gates and gas stations have gradually become a natural part of the street scene in car-dominated cities. 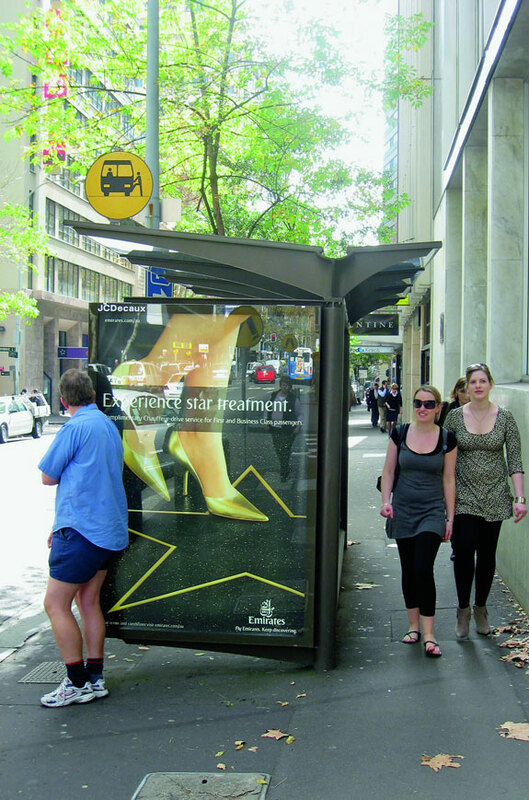 On Regent Street in London, 45 – 50,000 pedestrians daily force their way through 13 unnecessary sidewalk interruptions, and in Adelaide, South Australia, streets in the city center offer pedestrians no fewer than 330 unnecessary sidewalk interruptions. In addition to these meaningless interruptions that force pedestrians, wheelchairs and strollers up and down curbs at garages and gates, there are many unmotivated interruptions where small streets run into larger ones. In almost all of the situations mentioned, the sidewalk should be led unbroken through entrance ways and side streets as part of a general policy of inviting rather than discouraging pedestrian traffic. The combination of inadequate space and annoyances large and small is supplemented by endless waiting time at stoplights at city intersections. Pedestrians are typically given low priority and thus face long waits at red lights followed by short green-light periods. The green light often only lasts seconds before being replaced by blinking red signals meaning that it is now time to run to avoid delaying the traffic. When walking resembles an obstacle course (Sydney, Australia). In many places, particularly in the UK and other areas inspired by British traffic planning, crossing the streets is not a basic human right but rather something pedestrians have to apply for by pushing a button at intersections. Sometimes they even have to press three times to make it through the maze at complicated intersections. In these cities any thought of being able to walk 450 meters/1,476 feet in five minutes is a fantasy. The center of Sydney has many pedestrians, as well as many intersections, many stoplights, many pushbuttons and long periods of waiting. Here pedestrians can easily spend half of the total walking time waiting for the “walk” signal. Waits of up to 15 percent, 25 percent or even 50 percent of a walk are common on many traffic streets in cities around the world. 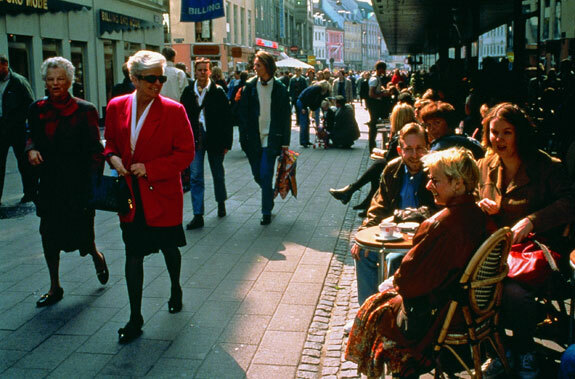 By comparison, the waiting time on a one-kilometer/0.6 mile walk on Copenhagen’s main walking street, Strøget, is only 0 – 3 percent of walking time. A goal-oriented walk through the city via Strøget can be done in 12 minutes, but many people spend far more time because the walk is so interesting. Another special walking phenomenon has been noted on sidewalks where crossroads streets and light signals cause pedestrians to stop frequently. Pedestrians move in clumps and therefore always in crowds, even at times when there isn’t much pedestrian traffic. Every time the pedestrian stream meets a red light the pedestrians stop, and the slightly slower walkers have time to catch up with the main field, after which everyone is once again amalgamated into a clump. When the light turns green, the clump moves forward again, but disperses slightly before the next stoplight, where everyone is gathered once again. Between clumps, the sidewalk is typically almost devoid of people. Urbanites all over the world are highly energy conscious when it comes to saving their own energy when walking. They cross streets where it is most natural for them, avoid detours, obstacles, stairs and steps, and prefer direct lines of walking everywhere. When pedestrians can see the object of a walk, they rechart a course along the shortest line. Their pleasure from direct walks can be seen clearly in city squares, by their footsteps after a snowfall and on countless tramped paths worn across lawns and landscapes the world over. Walking directly to your destination is a natural response, often in an unfortunate and almost comic conflict with architects’ rulers and the resulting right-angled urban projects. These right-angled design projects look neat and proper until the corners, lawns and squares are trodden on in every direction. It is often easy to foresee the preferred lines of walking and to incorporate them to a reasonable extent in the design of complexes and landscaping. Preferred lines often inspire fascinating patterns and shapes. Many cities have consistently allowed entrances, garages and side streets to interrupt sidewalks. However, cars should yield on side streets, allow- ing pedestrians and bicycles to continue on without interruption (Regent Street, London). 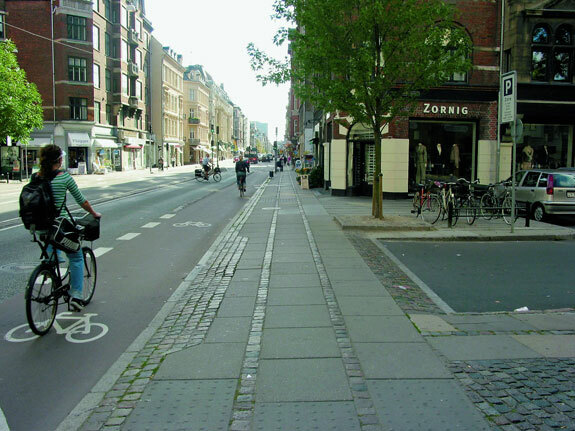 A standard traffic solution in Copenhagen. About 500 meters/1,640 feet is a distance most pedestrians find acceptable. This is not an absolute truth, however, because what is acceptable will always be a combination of distance and the quality of the route. If comfort is low, the walk will be short, while if the route is interesting, rich in experience and comfortable, pedestrians forget the distance and enjoy experiences as they happen. Even a long walk feels short along a curved road with plenty to see (Cartagena, Colombia). In contrast, the route can be divided into manageable segments, where people can walk from square to square, which naturally breaks up the walk, or along a street that winds enticingly, inviting the pedestrian from one section to the next. A winding street does not have to twist much to prevent the walker seeing very far down the street, but is constantly walking towards corners and twists, where new vistas open. Copenhagen’s main pedestrian street, Strøget, is a good kilometer/0.6 mile long and runs almost directly from one end of the city center to the other. Countless twists and turns along the way keep the spaces closed up and interesting. Four squares further divide the route and make walking the length of the city center psychologically manageable. We walk from square to square, and the many twists and turns make the trip interesting and unpredictable. Under these circumstances a walk of one kilometer/0.6 mile or more is no problem. Street patterns, the design of space, rich detail and intense experiences influence the quality of pedestrian routes and pleasure in walking. The city’s “edges” also play a role. We have plenty of time to look as we walk, and the quality of the ground floor façades we pass close by at eye level, is particularly important to the quality of the tour. The section on lively cities proscribes “small units and many doors” for streets frequented by pedestrians. The principle of narrow units and many experiences is also important along pedestrian routes that don’t have shops and stalls. Front doors, building details, landscaping and greenery in front of housing, offices and institutions can make a valuable contribution to interesting experiences on walks. If buildings also have a primarily vertical façade expression, walks seem shorter and more manageable, whereas buildings with powerful horizontal lines underscore and reinforce distance. Walking up stairs is harder than walking on a flat surface, and we avoid stairs whenever we can. And for many groups in society stairs are a direct barrier. Stairs and steps are another area that clearly illustrate pedestrians’ major interest in saving energy. Horizontal movements are no big problem. If the telephone rings in a neighboring room, we just get up and answer it. However, if the telephone rings on another floor, we shout to ask if someone else will answer it. Going up and down stairs and steps requires new movements, more muscle power, and walking rhythm has to be changed to climbing rhythm. These factors make it more difficult to go up and down than to move on the same plane, or alternatively, to be transported mechanically up and down. At metro stations, in airports and department stores, people stand in line to take the escalator, while staircases next to them are almost empty. Shopping malls and department stores built in several stories rely on escalators and elevators to move people from floor to floor. If the transport breaks down, people go home! It is interesting to study daily life in multistory housing. In almost all cases, the bulk of activity takes place on the ground floor. Once you have entered the living room, you naturally tend to wait before going upstairs again. Children bring their toys down into the living room, where they play with them all day until their parents take them back up again at bedtime. The lower floors are almost always more well-worn than the upper ones. Second-or third-floor rooms are almost always used less than those on the ground floor, and roof terraces are used far less than outside space with direct access without climbing stairs. The heaps gathered on the bottom steps waiting to be taken upstairs speak volumes about the physical and psychological problems related to internal stairs. 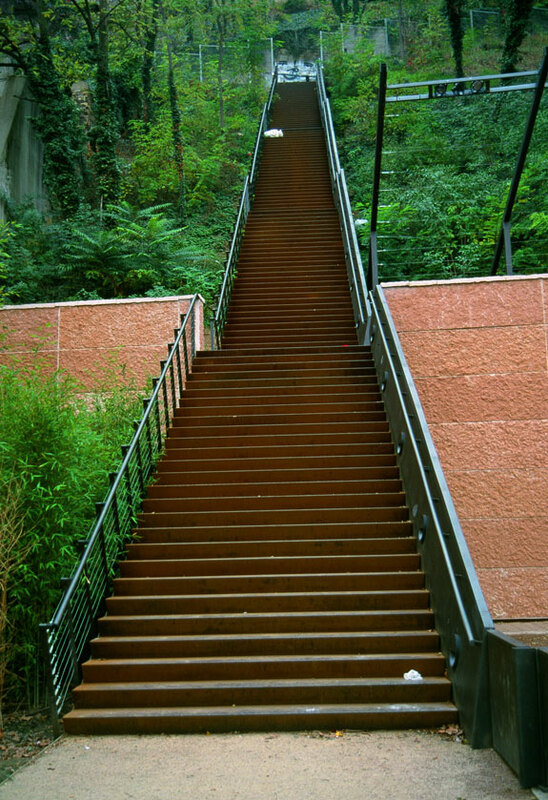 If we can see the staircase all the way to the top, we find the climb all the more tiring. Staircases are angled to wind from landing to landing, dividing the climb into shorter segments. It is like moving from “square” to “square,” and the climber never gets the chance to see the entire course of stairs in its exhausting length. That way we are enticed into the building, even if we have to climb. Even when the enticement is utterly convincing, it is the elevator that is the most used if there is one. Naturally staircase psychology is also used successfully in public space, where examples like the Spanish Steps in Rome demonstrate that a climb can be beautifully combined with interesting experiences. With regard to visions of lovely urban space that invite people to walk as much as possible, the conclusion is actually very simple. Stairs and steps are genuine obstacles — in principle to be avoided wherever possible. When a necessity in the pedestrian landscape, stairs and steps must have comfortable dimensions, and visual interest and staircase psychology must be used purposefully. 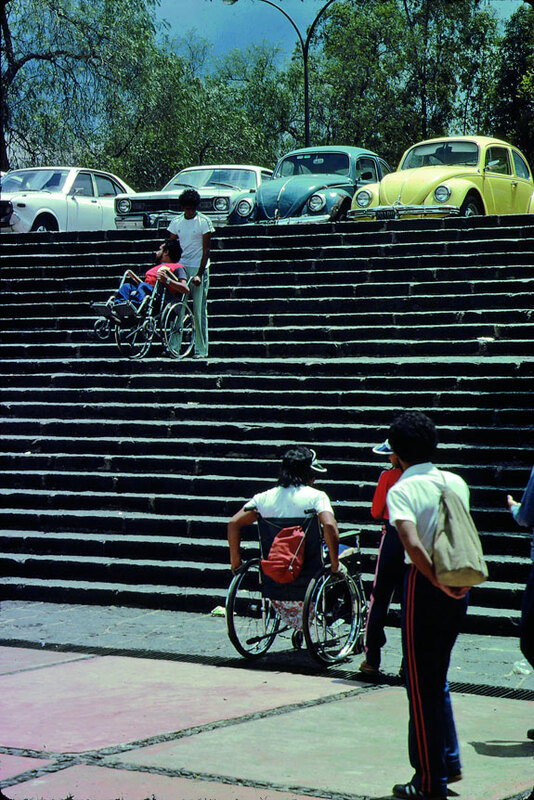 Ramps or elevators are estab- lished for rolling pedestrian traffic and people with reduced mobility as a matter of course. If we consider situations where pedestrians are free to choose between ramps and stairs, we see that they clearly prefer ramps. Walking rhythm can be maintained if height differences are evened out by allowing the terrain to rise and fall slightly or by using ramps. Children, the disabled and rolling pedestrian traffic can also complete their walk without interruptions. Ramps are not always as full of character as stairs and steps, but they are generally preferred. 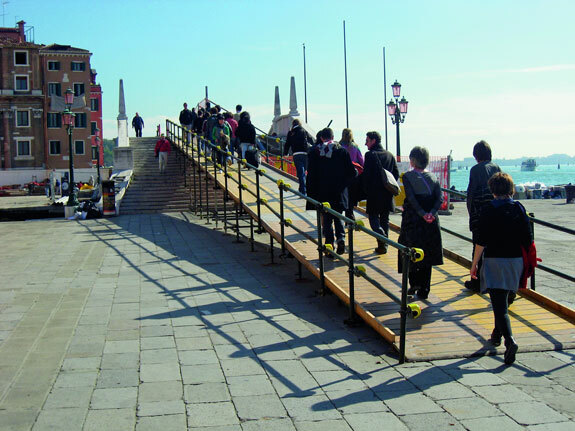 Marathon preparation in Venice means ramps instead of stairs. 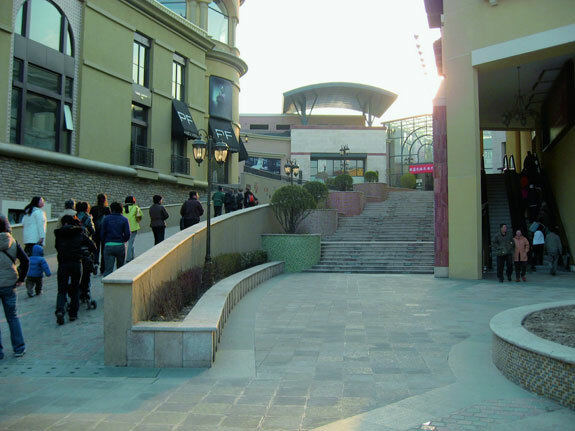 Shoppers have a choice of ramps, stairs and escalators at this shopping center in Beijing, China. In the early years of the automobile invasion, from the 1950s to the 1970s, road engineering focused uncritically on increasing capacity on the roads and preventing accidents to pedestrians. The solution to both problems was often to segregate traffic and lead pedestrians under or over roads by means of pedestrian underpasses and bridges. This meant subjecting pedestrians to stairs on either side of the crossing. Planners quickly learned that pedestrian underpasses and bridges were exceedingly unpopular and only worked if tall fences were also built along the roads, so that pedestrians literally had no other way out. This still did not solve the problem of strollers, wheelchairs and bicycles, however. Pedestrian underpass systems had the additional disadvantage of being dark and dank, and people generally feel insecure if they are unable to see very far ahead. In short, the often expensive pedestrian underpasses and bridges were in conflict with the basic premises for good pedestrian landscapes. Seen in the perspective of current visions of inviting people to walk and bicycle more in cities, clearly pedestrian underpasses and bridges can only be solutions in those special cases where major highways must be crossed. Solutions must be found for all other roads and streets that allow pedestrians and bicycles to stay on street level and cross with dignity. An integrated traffic model will also make city streets friendlier and safer as cars will have to move more slowly and stop more often. Today the world is full of abandoned pedestrian underpasses and bridges. They belong to a certain time and a certain philosophy. 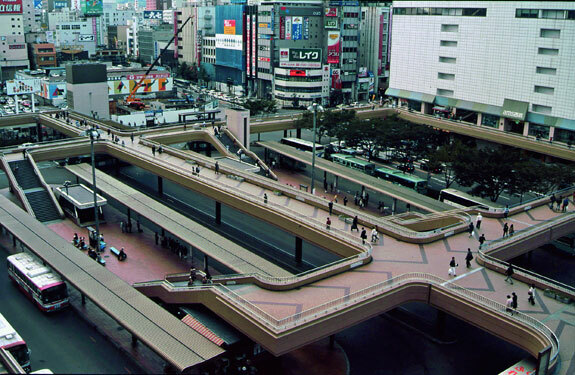 in Japanese cities the overpass- es are intertwined into larger systems. Level of difficulty: great. Chances of interesting promenades: small (Sendai, Japan). 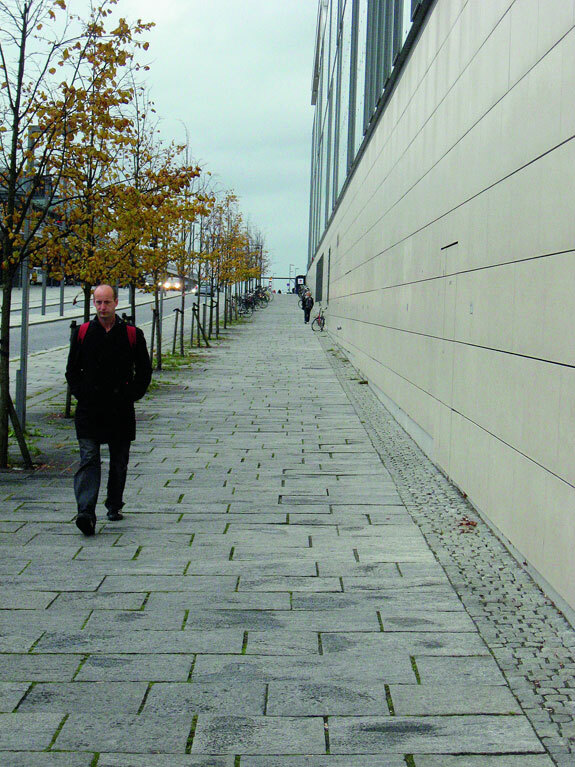 Naturally pavements play an important role in pedestrian comfort. 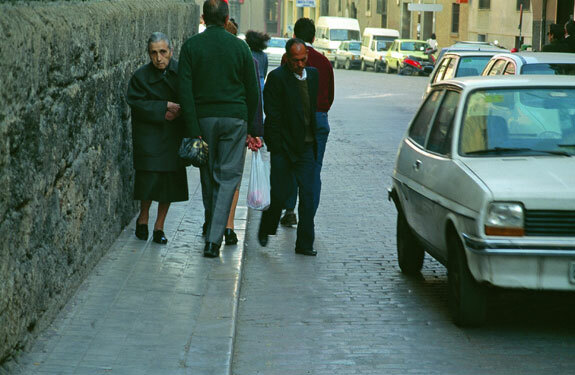 In future the quality of pavement and surfaces will be particularly important in a world with more senior citizens and pedestrians with reduced mobility, more rolling pedestrian traffic and more people wanting to take children to the city. It is desirable for surfaces to be even and non slip. Traditional cobblestones and broken natural slate stones are full of visual character, but seldom live up to modern requirements. In places where the character of the old cobblestones has to be maintained, bands of flat granite have to be added to enable wheelchairs, strollers, small children, senior citizens and women in high heels to move in relative comfort. This type of pavement, combining old with new, is used in many cities and can be designed as elegant floors for public space, while paying history its due. As far as possible, a good city for walking must function all year round, day and night. In winter it is important that snow and ice are cleared, and, to use the Copenhagen model as an example, pedestrian areas and bicycle paths should be cleared before roads for car traffic. On cold days when pavements are icy, pedestrians have a far greater risk of injury than do car drivers, who typically drive more slowly and carefully. In all parts of the world and in all seasons, ensuring dry nonslip surfaces for pedes- trians is an important part of whole-hearted invitations to walk in cities. Lighting is crucial once night falls. Good lighting on people and faces and reasonable lighting for façades, niches and corners is needed along the most important pedestrian routes to strengthen the real and the ex- perienced sense of security, and sufficient light is needed on pavements, surfaces and steps so that pedestrians can maneuver safely. Please walk — around the clock all year round.